History: Empoy was the child of a human mother and alien father from the planet Omnicron. Shortly after Empoy's birth both his parents were taken back to Omnicron; with the authorities believing Empoy's missing parents were dead, Empoy grew up thinking himself an orphan, oblivious to his true heritage. On Omnicron radiation forced Empoy's parents to wear specialised survival suits. 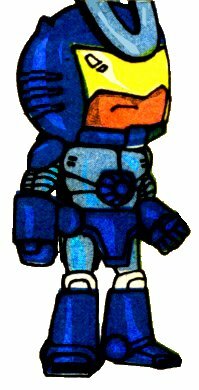 When the villainous Abodawn triggered a planetary war, Empoy's father created a prototype battle armor, and became Combatron. However, Abodawn's side won the war, and Empoy's parents became fugitives. Combatron fled back to Earth, where by monumental coincidence he crash landed near the graveyard containing his and his wife's empty graves just as Empoy was visiting same. Investigating the crash, Empoy found his dying father; though each was unaware of their familial relationship, Combatron entrusted Empoy with his armour, warning him that his enemies would soon follow his trail to Earth. Empoy became the new Combatron, ably assisted by his father's robot dog, Askal. Eventually a hologram of his late father told Empoy the truth about his parents. Thanks to Dan Ramon P. Geromo for information and images. Thanks to Nikki Erwin C. Ramirez and Bethoven Rodic Erazo for additional information.